Applications of the thermodA challenging frontier in modern statistical physics is concerned with systems with a small numberof degrees of freedom, far from the thermodynamic limit. Beyond the general interest in the foundationof statistical mechanics, the relevance of this subject is due to the recent increase of resolution in theobservation and in the manipulation of biological and man-made objects at micro- and nano-scales. The peculiar feature of small systems is the role played by fluctuations, which cannot be neglected andare responsible for many non-trivial behaviors. The study of fluctuations of thermodynamic quantities,such as energy or entropy, goes back to Einstein, Onsager, and Kubo; more recently, interest in thismatter has grown with the establishment of new fluctuation–dissipation relations, which hold even in non-linear regimes, and of the so-called stochastic thermodynamics. Such a turning point has received a great impulse from the study of systems that are far from thermodynamic equilibrium, due to very long relaxation times, as in disordered systems, or due to the presence of external forcing and dissipation,as in granular or active matter. 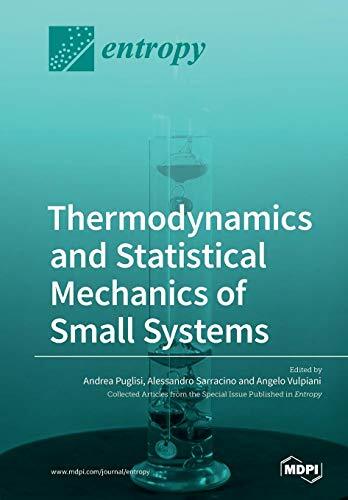 Applications of the thermodynamics and statistical mechanics of small systems range from molecular biology to micro-mechanics, including, among others, models of nano-transport, of Brownian motors, and of (living or artificial) self-propelled organisms. The Contributions In this special issue, we collect 20 contributions, spanning the above mentioned subjects. 6.ferromagnetic models .namic and statistical mechanics of small systems range from molecular biology to micro-mechanics, including models of nano-transport, Brownian motors, and (living or artificial) self-propelled organisms.